Summerfruit Australia represents the biosecurity interests of summerfruit (stonefruit) producers and the industry. Peaches and nectarines (Prunus persica) have white, pink or red flowers. They have five oval petals, more than 20 anthers surrounding a single pistil, and ovary that has two ovules, only one of which usually develops. The flowers produce nectar and pollen. The flowers are usually attractive to both nectar and pollen-foraging insects. Most varieties are self-fertile. Because of their attractiveness to pollinators, the self-fertility of most cultivars and the relatively small number of pollen grains that need to be transferred to the stigma, peaches and nectarines are much easier to pollinate than many other plant species. Honey bees are usually the most important pollinators of peaches but, as with many fruit trees, pollen collectors are more likely to contact the stigma as they scramble across the anthers. Some bees visiting peaches climb down through the anthers to reach the nectar and have good stigma contact, while others collect nectar from the side, and are thus less likely to touch the stigma. Bees visiting nectarines will also at times collect nectar from the side of the flowers, not touching the stigma. 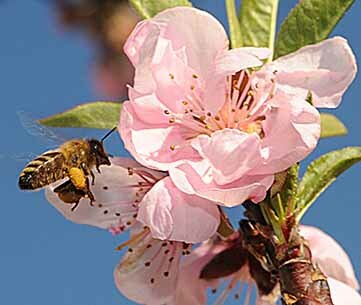 For this reason, colonies managed for pollen collection are likely to be better pollinators of peaches and nectarines. However, because of the flowers’ self-fertility, the difference between the efficiency of pollen and nectar gatherers may not be as large as for other fruit trees. 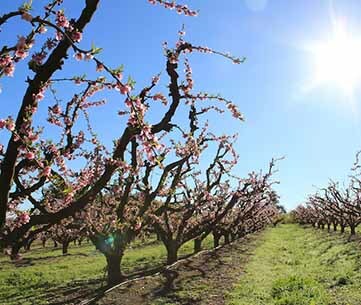 It is recommended that around 2.5 hives per ha are used for efficient pollination of peaches and nectarines, however, in high density orchards this may need to be increased. Apricot flowers (Prunus armeniaca) have about 30 stamens and one pistil. The blooming period usually lasts for one or two weeks. Some varieties are self-compatible, while others are not. Some cultivars of apricots require cross pollination and therefore they need to be inter-planted with an appropriate polliniser. Honey bees are important pollinators of apricots. They visit flowers to collect both nectar and pollen. However, because apricots flower early in the spring (mid August), the weather is often cool and rainy and will often not be suitable for honey bee foraging, which makes pollination difficult. The flowers are also often not very attractive to honey bees, as their nectar has very low concentrations of sugar, which will cause bees to move onto more attractive crops if they are available in the vicinity. 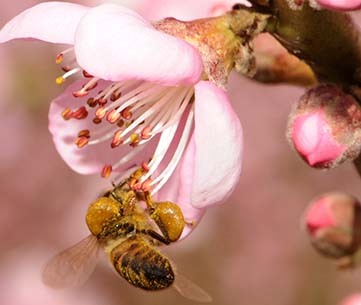 Pollen foragers are reported to visit apricot flowers faster than nectar foragers and are also more likely to touch the stigma while foraging and are therefore better pollinators. 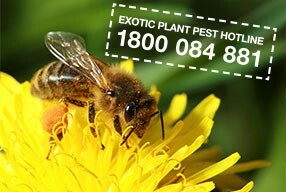 It has been suggested that for adequate pollination, a minimum of two bees need to be seen in a 30-s search of a tree. 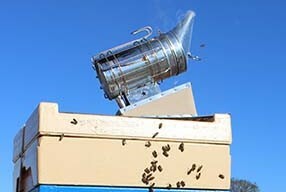 It is recommended that five hives are used per ha, however, in high density orchards this may need to be increased. Using colonies with a high demand for pollen will increase pollen collecting, as will trapping pollen and feeding sugar syrup. The most important plums (Prunus sp.) grown commercially are the European and Japanese plums. They produce clusters of white flowers that have five petals, one style and a ring of anthers. 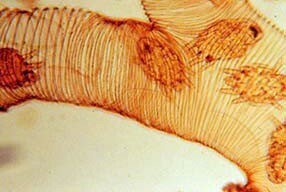 Species range from those that are self-fertile through to those that are completely self-infertile. When planting plums it is therefore important to find out if the variety needs cross pollination and if so, also to plant the variety required for pollination. Plums are commonly planted in a 1:8 distribution. Many problems with plum pollination occur because the necessary pollinisers are absent at flowering. Honey bees are the most important pollinators of plums because they can be introduced for pollination. 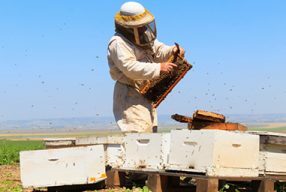 In a study on Japanese plums in the Goulburn Valley area of Victoria, Australia, 19 per cent of insect visitors were honey bees. The study concluded that other insect visitors lacked the behavioural traits to be effective pollinators. Honey bees visit flowers to collect both pollen and nectar. The flowers are more attractive to honey bees in the morning but they will visit them throughout the day. Sequential introductions of colonies (split introductions) are reported to improve pollination. 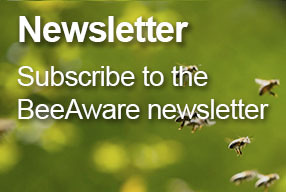 It has been reported that the optimum bee number that should be seen on trees is 12–14 bees/tree/minute. 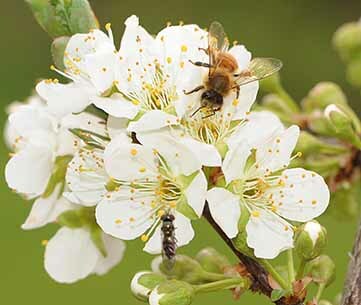 Between two to four hives per ha are recommended to efficiently pollinate plums, however, in high density orchards this may need to be increased.